percentage rate but when they do hit they usually pay very attractive prices. Some days there will be very few winners but on other days we have quite a few hits. In the world of horse racing it is very important to find value in betting situations. Tampa Bay-based handicapper has been playing and handicapping the horses for nearly 40 years, and has been producing tip sheets at various tracks throughout the country for more than 20 years. Over that period he has developed a Fair Odds database that looks for value in his selections with an interest in creating an odds line that points to horses going off at exceptional value. 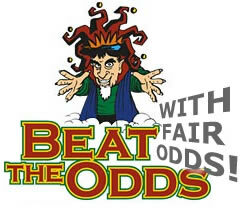 The system identifies what are the best betting situations available through use of his fair odds line. His top choice may not always be the best bet when the public agrees and bets the horse down below his fair odds line. In these situations it is very advantageous to look at our other choices to see if the value is better and by comparing his fair odds line with the tote board, and if it shows significantly higher odds - bet it! Remember not to eliminate true favorites, but by including better valued horses (especially longshots) in your exotics, your chances of scoring nice pay-offs are enhanced.